72 & 96 plate Coolers with 10" 1,000cfm Fans. Canada. At any time you need help or have a question ask the team that knows! Good for Bugs, Ghia, Bus, Thing, Off Road/Baja etc. hose and 2x 90* fittings, 4x straight fittings and 2x hose end fittings to hook up to your full flow engine. and 2x 90* fittings, 4x straight fittings, 2x hose end fittings to hook up to your full flow engine. Red and Blue AN Fittings. Same as other kits but also includes a Sandwich adapter to run external oil cooler. Comes with Red and Blue AN Fittings. Same kit with Black AN Fittings. hose and 2x 90* fittings, 4x straight fittings and 2x hose end fittings to hook up to your engine. Comes with Red/Blue AN Fittings. 180* Cooler fan switch, for use with AN -8 fittings. 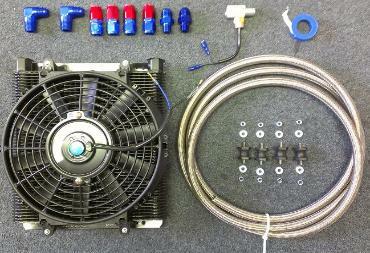 $49.99 Now you can run an extra oil cooler! hose end AN fittings to hook up to your full flow engine.